Extract from Sir William Young's 'Almanac for the Island of Tobago in the year 1810.' Young was Governor of the island from 1809 until his death in 1815 and the almanac gives an insight into the official duties of a governor at that time. In this extract he notes some of the events that he attended in the month of January: ?Thursday January 18th. Queen's Birthday, -Dinner & Ball at Government House. Ladies 12. Gentlemen 24. Jan 20th as Governor Received the Militia, on Cinnamon Pasture? 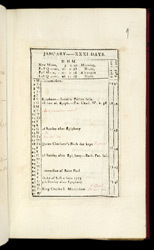 Young also used a printed diary containing ecclesiastical official dates such as Epiphany, to which he has added his own engagements and the dates of the expected postal deliveries.